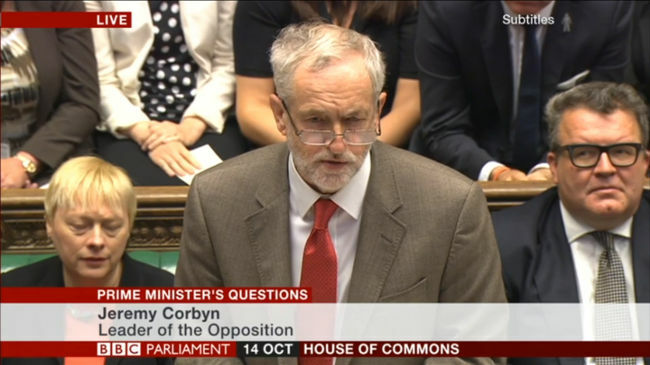 If the first round of Jeremy Corbyn’s “people’s prime minister’s questions” was regarded by journalists as a bit of a flop, his refined approach for the second bout looked much stronger. On Wednesday afternoon, the Labour leader began his six questions as leader of the opposition by reading out an email from a single mum of a disabled child Kelly, who works more than 40 hours each week and is paid £7.20 per hour. If all this sounds like a lamentable conference speech from Corbyn’s predecessor Ed Miliband do not be fooled. For Corbyn’s deployment of this question was explicitly to attack Cameron for his government’s revising of tax credits, which both the Institute for Fiscal Studies and the Treasury admit will make people worse off in the short-run. A pregnant pause in the question in which Corbyn glared at the government benches showed the problems the Tories will have in countering such tactics, which combine anecdotes with statistics. Whilst the latter will be at Cameron’s fingertips, the former will not be so close to hand. And it’s harder for Tories to jeer voters than Labour pols. Following the advice of many pundits after his first attempt at PMQs, Corbyn followed up his email reading with further interrogation, even embracing the rudeness he initially claimed to avoid. “The prime minister’s doing his best, and I admire that,” he deadpanned at one stage, to approval from his side of the House. This is not quite “the new approach”, to use the same term that Cameron did as he sought to silence jeers from the opposition benches. Indeed the end result was somewhere in the middle of the ear-damaging bellows that used to dominate the entirety of PMQs and the silence that greeted Corbyn’s first session at the head of Labour. Whilst this will not appease those that see the behaviour of the politicians in these sessions as childish, it will play rather better on television and radio, and not allow Cameron the free hits he was given last time round as Corbyn slowly read through one email after another. Corbyn’s performance at PMQs will not affect the difficulties he is likely to have with poorer voters sceptical of migration, nor Blairites and those on the left who are willing to accept more private sector involvement in delivering public services. But at least in the one session of the Commons every hack pays attention to he looks competent, astute, and on the side of the poor he aspires to represent. At least for now the rebel Corbyn is starting to play the game.